Made simply of five large circles of fabric and a supporting aluminum structure, James Turrell’s Aten Reign transforms the Guggenheim’s iconic atrium into an awe-inspiring installation. To learn about how the Guggenheim and Turrell pulled off one if the most complex installations in the museum’s history, we caught up with Head Curator Nat Trotman. With retrospective exhibitions across the country, what attracted Turrell to the Guggenheim in particular? James Turrell visited the Guggenheim for the first time in 1966 where he saw a Barnett Newman exhibition. He was attracted to the unique roundness of the space and for this exhibition in particular he wanted a place where he could create something with curves. While LACMA and the other host galleries have rectilinear shape that is best suited for his rectilinear pieces. 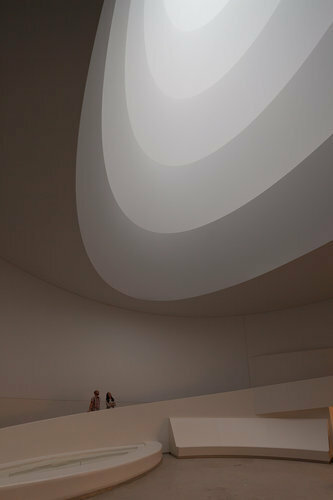 No building in the world has the curves and daylight that the Guggenheim rotunda has, and I think Turrell saw an opportunity to utilize this one of a kind place. Not everyone realizes how long it takes to create an exhibition. When did plans for this particular one start? At the Guggenheim, we had longstanding discussions about hosting a James Turrell show, but for this moment, this summer, I was handed the project almost six and a half years ago. 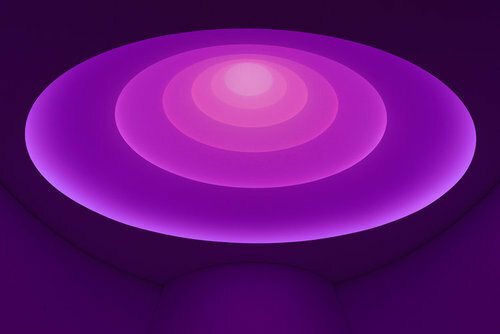 That’s when we began speaking with Turrell and figuring out a way we could create a show together. In 2009, James had the idea to take over the Rotunda with the idea of creating conceptual layers that would make use of the daylight that comes into the space. It was a basic concept that would then manifest itself through a long back and forth between our internal installation team and Turrell, as they figured out what would be physically possible to carry out in this space. So in the case of this art installation, it became much more of an architecture project with someone guiding the process but with a strong team who works to figure out where the vision meets reality and the logistics that accompany it. How many hours did the installation piece take? Lots. I think of this project more in terms of months and days. Assembly for the project started in March, where our team was putting together pre-fabricated trusses and pieces in a warehouse in New Jersey before bringing the half assembled structure into the museum. Then once, the structure reached the Guggenheim it took about five weeks to bolt it in place and construct the walls that mask it. Each section had to be lifted and placed individually. It was a difficult task, but thanks to our talented team they were able to pull it off.